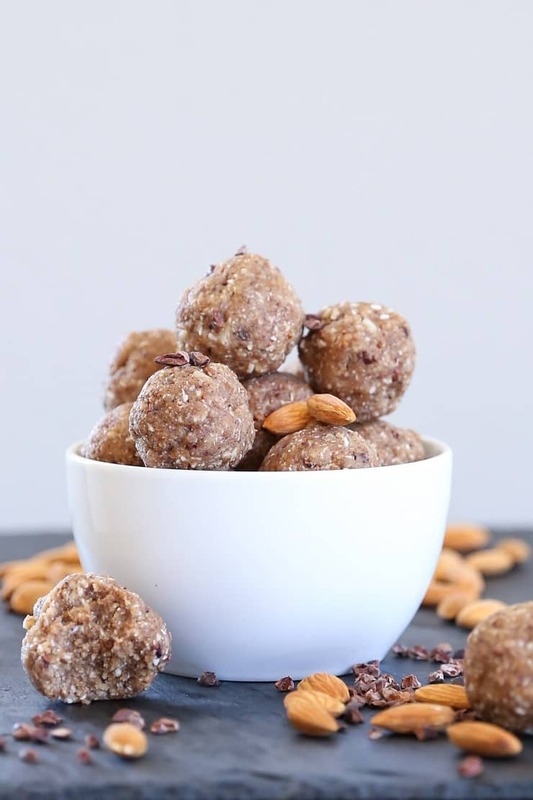 Nuts, seeds, coconut oil, and pure maple syrup make up these ketogenic fat balls for a highly customizable snack. Full of fat and protein, these bites are perfect for a paleo or low-carb diet. This post is sponsored by Vital Proteins. Also known as energy balls, protein balls, protein bites, snack balls, you name it. While there are a ton of recipes for the ball food group on the internet, there are some differentiating factors between them. 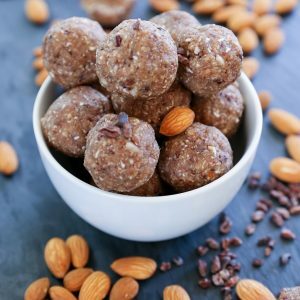 Some ball recipes you’ll come across are made using oats, dates, and/or other ingredients that contain carbohydrates or high amounts of sugar. While there’s definitely nothing wrong with these types of snacks, I personally avoid high amounts of sugar and grains because I have IBS and find by body functions better on a very low carbohydrate and sugar diet. The difference between a fat ball (or keto ball) and some of the other energy bites out there is they’re exactly how they sound – packed with fat. Keto balls are designed to be low in sugar and carbohydrates, upping the fat ante for a snack that feeds your ability to burn fat for fuel rather than carbohydrates. Which brings me to my next point – let’s back up a bit. In case you’re unfamiliar, ketosis is a metabolic process wherein your body burns fat for fuel when it doesn’t have enough glucose to convert into energy. In this sense, for one to stay in a state of ketosis, consistently consuming a low-carbohydrate diet is necessary so that the body is trained to recognize fat as fuel. 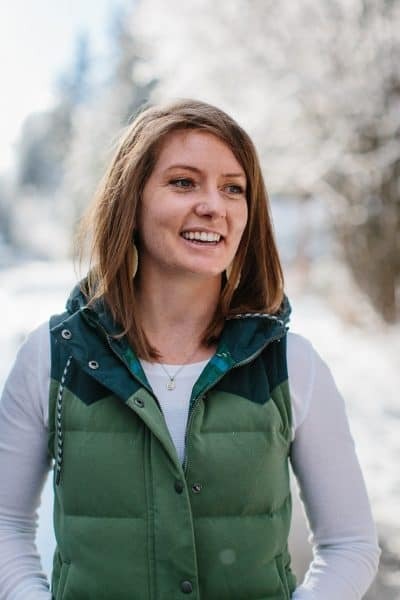 This method of living generally results in high energy and athletic performance, although when many people first begin eating a ketogenic diet, they notice a short-term decrease in energy until their body is in ketosis. Acheiving ketosis does take time and only works when one truly sticks to a low-carbohydrate diet. In my humble opinion, a ketogenic diet is unnecessary unless you’re doing so for specific health or fitness reasons – if your body thrives on carbohydrates and your overall health is good, I don’t see a reason to stop doing what works for you. You may have read in my How to Make Bulletproof Coffee post that I tend to eat a diet high in fat, because my body doesn’t process carbohydrates well. In essence, I’ve trained my body to efficiently burn fat for fuel rather than carbs and sugar. While ketosis can have a weight-loss effect, and/or make you look supremely awesome naked, the purpose of eating a high fat diet for me is for health, not vanity. There are a great deal of opinions out there on who should be eating what in which amount. I generally ignore unsubstantiated statements and go with my gut – literally. I eat a diet my body loves and craves, which happens to be paleo-centric. Okay, so now we have the theory down – fat for fuel, protein for strength and macronutrients – lettuce talk about these specific balls. 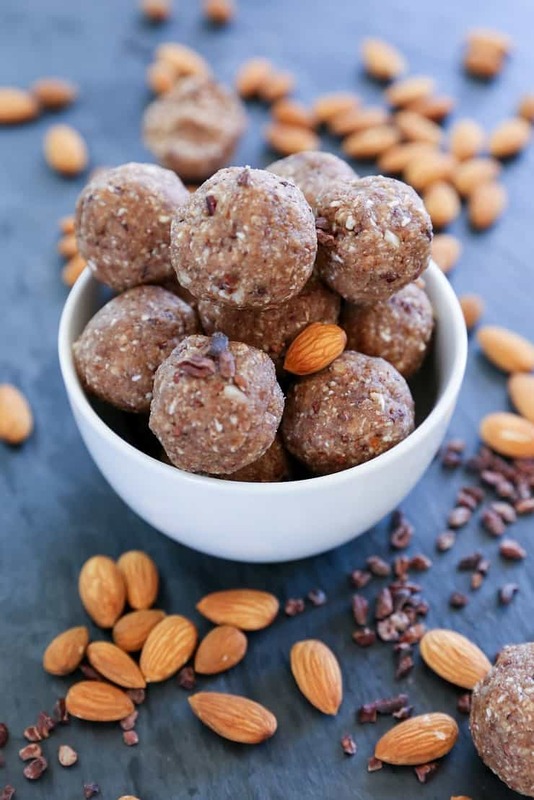 Made with raw nuts (I like using almonds and cashews), nut or seed butter (I use sunflower seed butter), pure maple syrup, coconut oil, and collagen powder, these balls equate to balls of high-octane energy in the form of protein and fat. I use pure maple syrup to sweeten the balls, but as I mentioned earlier, you can use a zero sugar sweetener, such as Erythritol, xylitol, or monk fruit sweetener. I don’t add very much sweetener to the balls because the intent for me isn’t to eat these as a sweet treat or dessert, but rather a high-quality fat bomb snack. I choose pure maple syrup over a zero-sugar sweetener because sugar alcohols upset my IBS. If you have gut issues, I suggest sticking with a natural liquid sweetener like pure maple syrup. I add Vital Proteins Marine Collagen to my ketogenic fat balls, because they provide an additional nutrient boost which I find to be extremely helpful. In case you aren’t familiar with the benefits of collagen powder, you can learn more from my Rejuvenating Peach Spinach Smoothie Bowls post – or, The quick run down is collagen is helpful with digestion, repairing your gut lining, which is awesome for folks like me who have Irritable Bowel Syndrome or other digestive issues. In addition, collagen is the protein building block for your skin, connective tissue, ligaments, muscles, bones, hair, nails, etc. The powder is flavorless, so you won’t notice a difference in the flavor of the balls. I love that the simple addition of the powder generates more protein and benefits to my GI tract and tissue. There are a myriad of ways you can go about this recipe. You’ll notice I kept certain ingredients vague (see my recipe notes for details) so that you can customize them to your heart’s delight. You can use virtually any nut you’d like (walnuts, almonds, cashews, and macadamia nuts work great), any nut or seed butter (sunflower seed butter and almond butter are my favorites), and can get creative by adding dried fruit, cocoa powder, extracts, etc. Also consider adding Vital Proteins also makes beauty collagen, banana, vanilla whey depending on the nutrients you’re going for. Flavor-wise, these balls taste nutty and coconutty with a slight chocolaty undertone from the cacao nibs. They’re not overly sweet, so feel free to adjust the sweetness to your own palate. These fat bombs are perfect for packing for road trips, airline trips, hiking, biking, trail running, etc. They provide instant workable fuel to keep you energized and replenish your calorie tank. If you’re an athlete, and/or are training for an event, these are your jam! If you’re a parent of children with food intolerances, these are also a great resources for summer snack or school lunches. Add the raw nuts to food processor and process until finely chopped. Add the remaining ingredients to the food processor and process until a thick paste has formed. The dough should be sticky. Roll the fat ball mixture into 16 to 20 balls. Store in a zip lock bag in the refrigerator or freezer (balls thaw quickly, so I store mine in the freezer). *I used 1 cup raw almonds and ½ cup macadamia nuts, but you can use any combination of your favorite nuts. ***Use 2 to 3 tablespoons zero-sugar sweetener such as Erythritol, monk fruit sweetener, or xylitol or a few drops of liquid Stevia to make these a completely sugar-free ball for a ketogenic diet. If you aren't on a ketogenic diet, you can increase the amount of pure maple syrup to up to 5 tablespoons for a sweeter ball. Thankyou! Looks like a great recipe. How much collagen powder do you add? Hi Anna! Woops! I just added the quantity to the recipe – I used 2 scoops (about 3 to 4 tablespoons) 😉 Enjoy!! I just started a month ago doing away with wheat, rice, and any other grains other than Oats. Please let me know if there are other grains I can eat that won’t cause Wheat Belly. I also have cut most of the sugar out of my diet. Thanks for this recipe and I will give it a shot. Oh, so far I have lost about 10-15 lbs doing this. If I can get my body to start eating fat as fuel, That would be AWESOME. How many net carbs are in these? How much protein? Thanks! Oh my goodness! I just tasted this mixture (it’s still in the Ninja bowl, chilling a bit on the fridge) and it is scrumptious. 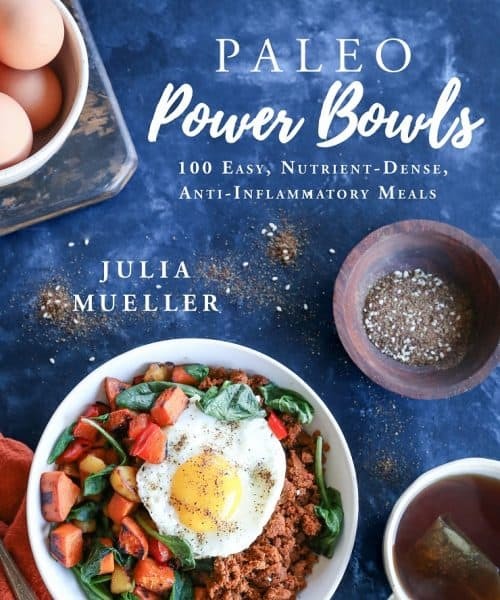 I pieced together what I already had in the cupboard–unsweetened coconut chips, unsweetened almond butter, a combination of pecan meal and sliced almonds, Vital Proteins Collagen Peptides (4 T.), the maple syrup and the rest as written. I don’t have any cacao nibs on hand, but I might stir in some dark chocolate cocoa powder into part of the batch. Wahoo! I’m so happy to hear it, Francine! I’m super into the fat balls…I make them all the time! Hope you love them! I’m not a fan of shredded coconut, and don’t have any in the house but would love to try this recipe. Is there a good sub for the coconut? Thanks! Hi Deb! No sweat! I would just add 1/2 cup more nuts and seeds 😀 I’ve made the fat balls quite a few times without shredded coconut, and they still turn out great! How much stevia to add if you aren’t using maple ? Start with 2 tablespoons and increase depending on your personal taste 🙂 If you’re using liquid Stevia, start with a few drops and go from there. Hope you love these! Do you have nutritional info on the balls? I made them and they are great. Thank you! These are epic. I used 4 dates instead of maple syrup. Augh. So good! Thank you. These are right up there with your grain free granola. Hey there, these look lovely. I was just looking for a breakdown of the macros – thanks!! Is the collagen necessary in these? Is there a substitute?